For the 2014 film, see Sand Dollars (film). 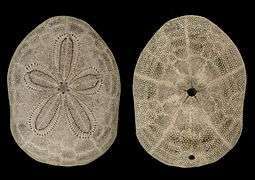 The term sand dollar (or sea cookie or snapper biscuit in New Zealand, or pansy shell in South Africa) refers to species of extremely flattened, burrowing sea urchins belonging to the order Clypeasteroida. Some species within the order, not quite as flat, are known as sea biscuits. Related animals include other sea urchins, sea cucumbers, and starfish. Leodia sexiesperforata by Louis Agassiz (1841). Encope emarginata (aboral and oral faces) dby Ernst Haeckel (1904). 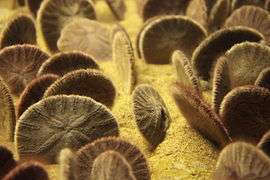 Sand dollars, like all members of the order Clypeasteroida, possess a rigid skeleton known as a test. The test consists of calcium carbonate plates arranged in a fivefold radial pattern. In living individuals, the test is covered by a skin of velvet-textured spines which are covered with very small hairs (cilia). Coordinated movements of the spines enable sand dollars to move across the seabed. The velvety spines of live sand dollars appear in a variety of colors—green, blue, violet, or purple—depending on the species. Individuals which are very recently dead or dying (moribund) are sometimes found on beaches with much of the external morphology still intact. Dead individuals are commonly found with their empty test devoid of all surface material and bleached white by sunlight. 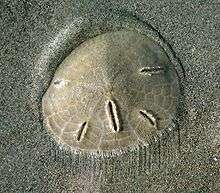 The common sand dollar, Echinarachnius parma, is widespread from intertidal zones to considerable depths in the ocean waters of the Northern Hemisphere. It can be found in temperate and tropical zones. 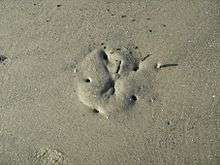 The keyhole sand dollar (three species, genus Mellita) is found on a wide range of coasts in and around the Caribbean Sea. Eccentric sand dollars (Dendraster excentricus) at Monterey Bay Aquarium. Clypeaster aegypticus, showing internal buttresses. Sand dollar beneath the sand at low tide on Hilton Head Island. Live sea biscuit, Clypeaster rosaceus, commonly found off Key Biscayne, Florida. family Dendrasteridae Lambert, 1900 -- Pacific eccentric sans dollar. The term "sand dollar" derives from the appearance of the tests (skeletons) of dead individuals after being washed ashore. 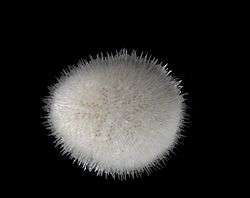 The test lacks its velvet-like skin of spines and has often been bleached white by sunlight. To beachcombers of the past, this suggested a large, silver coin, such as the old Spanish or American dollar (diameter 38-40mm). Other English names for the creatures include sand cake and cake urchin. In South Africa, they are known as pansy shells from their suggestion of a five-petaled garden flower. 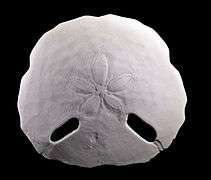 The Caribbean sand dollar or inflated sea biscuit, Clypeaster rosaceus, is thicker in height than most. 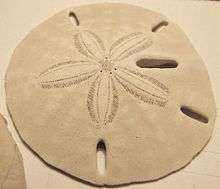 In Spanish-speaking areas of the Americas, the sand dollar is most often known as galleta de mar (sea cookie); the translated term is often encountered in English. The various common terms (sand dollar, sea biscuit, etc.) sometimes appear printed in hyphenated forms (sand-dollar, sea-biscuit). 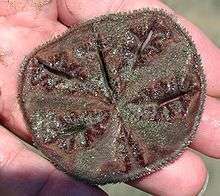 Sand dollars live beyond the mean low water line on top of or just beneath the surface of sandy or muddy areas. The spines on the somewhat flattened underside of the animal allow it to burrow or to slowly creep through the sediment. Fine, hair-like cilia cover the tiny spines. Podia line the food grooves that move food to the mouth opening, which is in the center of the star-shaped grooves on the underside of the animal (called the oral surface). Its food consists of crustacean larvae, small copepods, diatoms, algae and detritus. 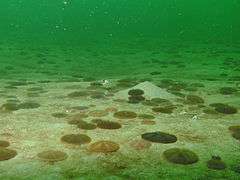 On the ocean bottom, sand dollars are frequently found together. This is due in part to their preference for soft bottom areas, which are convenient for their reproduction. 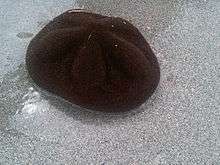 The sexes are separate and, as with most echinoids, gametes are released into the water column and are conceived by external fertilization. The nektonic larvae metamorphose through several stages before the skeleton or test begins to form, at which point they become benthic. 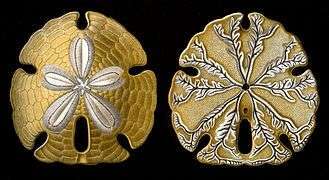 In 2008, biologists learned that sand dollar larvae clone themselves as a mechanism of self-defense. Cloning is an asexual reproductive mechanism, where the cost is borne by the larva both in resources as well as in development time. Larvae have been observed to undergo this process when food is plentiful or temperature conditions are optimal. It has also been suggested that cloning may occur to make use of the tissues that are normally lost during metamorphosis. Recent research has shown that the larvae of some sand dollars clone themselves when they detect predators (by sensing dissolved fish mucus). Larvae exposed to mucus from predatory fish respond to the threat by cloning themselves, thus doubling their numbers while effectively halving their size. The smaller larvae are better able to escape detection by fish, but may be more vulnerable to predation by smaller animals, such as pelagic and planktonic larval stages of crustaceans. Sand dollars in their mature form have few natural predators, though ocean pouts and sunflower starfish are known to eat them on occasion. 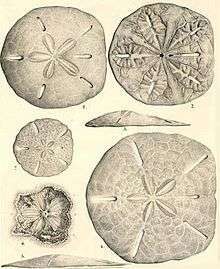 The ancestors of sand dollars diverged from the other irregular echinoids, namely the cassiduloids, during the early Jurassic, with the first true sand dollar genus, Togocyamus, arising during the Paleocene. Soon after Togocyamus, more modern-looking groups emerged during the Eocene. A variety of imaginative associations have been made by idle beachcombers who run across the bleached skeletons of dead sand dollars. The tests are sometimes said to represent coins lost by mermaids or the people of Atlantis. Christian missionaries found symbolism in the fivefold radial pattern and dove-shaped internal structures. 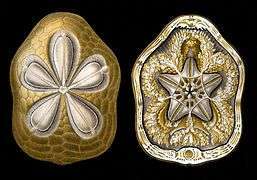 "Aristotle's lantern" has been discerned in the distinctive perforations of keyhole sand dollars. ↑ "Sand Dollar Printout - Enchanted Learning Software". Enchanted Learning. 2000. 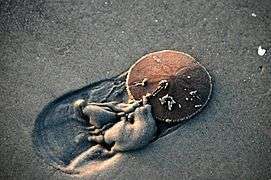 ↑ "Change for a Sand Dollar? -- Mason 2008 (313): 1 -- ScienceNOW". Retrieved 2008-03-14. ↑ Vaughn D and Strathmann RR (2008). "Predators Induce Cloning in Echinoderm Larvae". Science. 319 (5869): 1503–1503. doi:10.1126/science.1151995. PMID 18339931.